This publication is available to download for free for registered users of this website. 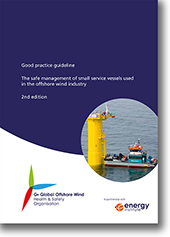 In 2013 the G+ commissioned the development of the good practice guideline: The safe management of small service vessels used in the offshore wind industry, the 1st edition of which was published in 2014. Following publication of the guideline, in 2016 the G+ agreed to commission an update to the guideline to ensure that it remained fit for purpose and continued to be a useful source of information to industry. This updated guideline addresses small service vessels, which for the purposes of this publication are defined as vessels less than 500 GT, operating in offshore wind farms under instructions from site management. The information given is intended to be applicable to all offshore wind farms globally, but is consistent with national requirements for the UK, Germany and Denmark. It represents the G+ interpretation of good practice, designed to be reflected in the management systems of the G+ member companies. Other operators of offshore wind farms might also find this guide useful when defining their site operating procedures. Functional roles and responsibilities for parties involved in the management of service vessels. Audit and inspection regimes for service vessels engaged by the wind farm. Operating procedures and guidance for the control and coordination of service vessel activities within the wind farm. Operating procedures for routine marine operations and vessel activities in the wind farm. Management of vessel traffic within the wind farm and in transit to the wind farm. Training and competence of service vessel marine crew, industrial personnel, passengers, and Marine Coordination personnel.